West Texas cotton farmers will take just about any water they can get – even from the city sewage treatment plant. Doug Wilde’s dad would send him off to school with the joke to “flush twice today, we need the water.” But in all sincerity, the growing global concern dealing with fresh water and fertilizer supplies means that this valuable resource will be recycled wherever urban areas are adjacent to agriculture lands. 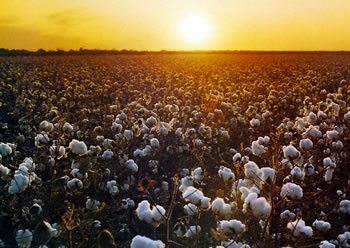 The Wilde’s have pioneered many technologies on their 4,000 acre cotton farm in San Angelo, Texas. 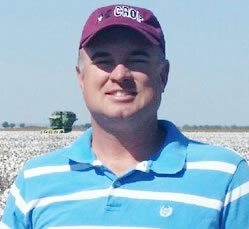 They were early adopters of drip irrigation in their area, now installed on 1,200 acres of their farm, and most recently have worked with their IPM Specialist, Rick Minzenmayer, to identify and refine the use of TopGuard for Texas Root Rot control. In this month’s Spotlight we will focus on innovations to better utilize city effluent water. In water science lingo, there are three types of water: “Green water” is rain that soaks into the soil; “Blue water” is fresh water stored in rivers, lakes or aquifers; and “Gray water” is degraded, discharge water. In dry regions we need maximum efficiency from all three water sources. The Wilde’s achieve extremely high Blue water efficiency with well-engineered subsurface buried drip that is 95% efficient. Green water is also maximized and well utilized when rain soaks into their reduced tillage fields and high yielding crop roots (not weed roots or surface evaporation) extract water from the soil. The challenge is using Gray water, since people flush year round and on-farm fertilizer inputs need to be adjusted for the variable nutrients in the Gray water. Crops transpire water when sunlight, warmth, and dry wind combine to evaporate water from inside the leaves during the summer. Thus to utilize a year-round water source requires storage, which the subsoil provides on the Wilde farm. They put 4 inches of Gray water into the soil during the winter using their buried drip system. That is about 100,000 gallons of water per acre or 30,000 toilet flushes per acre. Water filtration at the farm is critical with Gray water, so they doubled the recommended filtration capacity, use high-tech disc filters, and flush the buried drip tape three times per year. Since P and K from the Gray water can also be stored in the soil, they rely on soil testing to guide cotton fertilization. Desert soils tend to be high in K, but low in P, so phosphoric acid is the P fertilizer of choice because it also drops the pH thus avoiding calcium phosphate precipitates that clog the drip emitters. Gray water can have salts, so Doug relies on rain to leach salts that accumulate in the surface from the buried drip. As cotton growers well recognize, excess nitrogen can reduce leaf drop by keeping older leaves green and stimulating late season leaf growth. To avoid this problem with Gray water, they switch to Blue water for the final cotton irrigations of the season. Although the use of Gray water in agriculture requires extra attention to nutrients, water supply, and any contaminants, the improved utilization of this resource will benefit both the urban population and growers alike. Further information on Blue, Green and Gray water is available in CSA News.